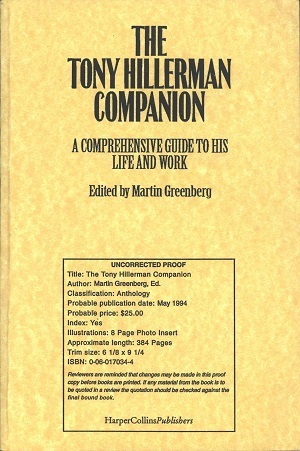 This is the Advance Reading Copy of The Tony Hillerman Companion: A Comprehensive Guide to His Life and Work, edited by Martin Greenberg and published by HarperCollins Publishers in New York City, NY. The cover contains the text "Reviewers are reminded that changes may be made in this proof copy before books are printed. If any material form the book is to be quoted in a review, the quotation should be checked against the final bound book." This guide includes a detailed synopsis of each novel, concise sketches of every character, an extensive, never-before-published interview with Hillerman, and a timeline of the most important events in his life. It also contains a selection of Tony Hillerman's fiction and nonfiction work. Why Not Religious Freedom for All Americans? Format: Paperback, 23.5 x 15.5 cm. Binding: Paper covers with black print. The editor, title and publisher are printed in black on the spine.